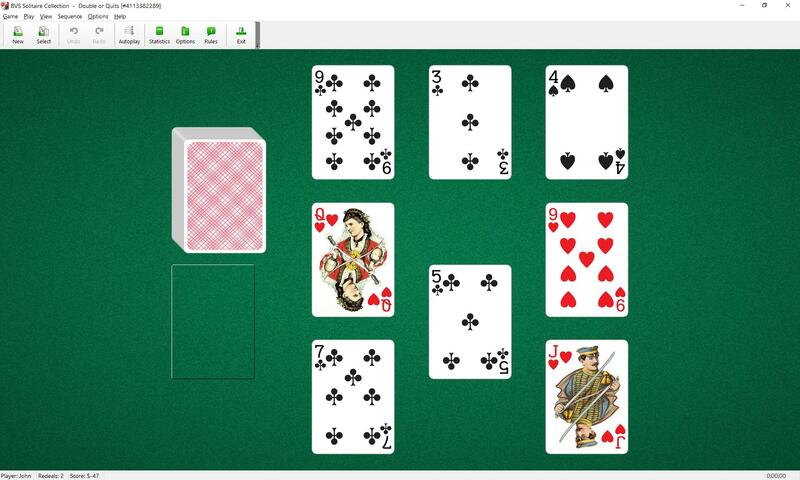 Double or Quits Solitaire uses one deck (52 cards). One foundation and 7 reserve piles are placed on the board. One card is dealt face up to each pile at the start of the game. If any of the initially dealt cards should be a king, it is placed at the bottom of the stock pile and replaced with another card from the stock pile. To build all cards except kings on the foundation by doubling the rank of the top card of the foundation. The top card of the waste pile and cards in reserve piles and are available for play. Cards count for their rank value from ace (one) up to ten; jack counts for eleven; queen, twelve; and king, thirteen. Build the foundation regardless of suit by doubling rank value. 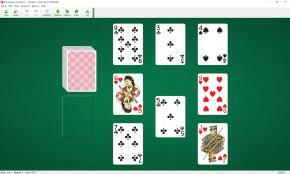 If the double is over thirteen, the excess of the double over 13 denotes the card required. The sequence is the following: 2, 4, 8, 3, 6, Q (12), J (11), 9, 5, 10, 7, A, 2, etc. A king placed in the reserve must stay there till the end of the game. Spaces are automatically filled from the waste or, if none, from the stock.